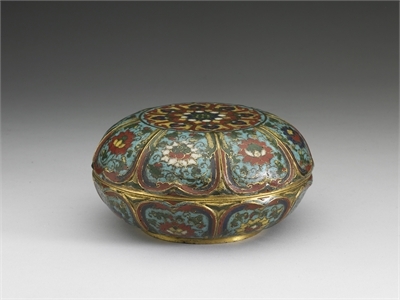 This lotus cloisonné box is composed of filigree work on a copper body. The flat lid is decorated with lotus blossoms and pods. The sides of both the box and lid are curved after the shape of lotus petals. The edges of the petals stand out and the tips curl outwards, and there is great variation in the representations and in the lines of every petal, stem, and blossom. The box feels very heavy in the hand and exhibits intricate craftsmanship, with perfectly rendered filigree work on which the traces of gilt plating are still clearly discernible. The vibrant enamels used to fill the compartments between the filigree include yellows, indigo blues, light blues, vibrant reds, and fluorescent whites. The inside and base are gilt, and the bottom of the inside of the box has a row of Chinese characters in standard script reading, "Made during the Jingtai Reign of the Great Ming." According to the early Ming dynasty aficionado Cao Zhao, cloisonné would not suit the man of letters, and was more suited to the woman's chambers. 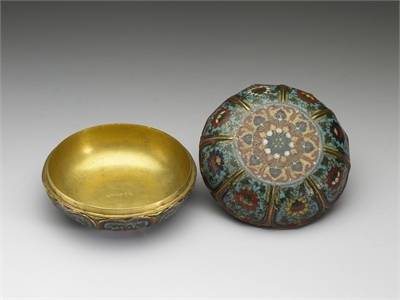 Regardless of Cao Zhao's ridicule, cloisonné became extremely popular in the Ming dynasty, and it subsequently became known as "Jingtai Blue" ware. The reason for this was most likely the fact that the cloisonné made in the imperial workshops during the Jingtai reign enjoyed the most fame. In the late Ming dynasty, collectors held these Jingtai pieces in the highest regard, believing them to represent the apex of Ming art, together with Chenghua ceramics, Xuande bronzes, and Yongle lacquer ware. It is very difficult to distinguish which of the extant Jingtai pieces are genuine, but this censer box is a rare example of a piece that conforms to the style of the period.